Before you conclude Lewis Crathern of the UK is crazy, consider first the efforts he's making to publicize the populous, including schoolchildren, about the importance of wind power as a renewable energy. And he is educating the masses in a very unique way: With kitesurfing (aka kiteboarding). Story about jumping Brighton Pier in UK's The Sun. OK, now the crazy part. If you missed it, Crathern, a four-time British pro men's kitesurfing champion, gained world-wide fame in November 2010 when he became the first to jump Brighton Pier in the UK. He did it while kitesurfing. Today, the behind-the-scenes story of that historic and daring (or crazy, if you prefer) jump over the pier is making the rounds on the Internet in the form of a documentary. "The Man that Touched the Sky" is a 29-minute film (click above) that premiered at the 2011 Brighton Film Festival but is posted on YouTube. The Man that touched the sky is an in depth look at the pioneering kite jumping extraordinaire Lewis Crathern preparing for the biggest jump of his life over Brighton Pier, an exclusive look behind the scenes into Lewis' life, showing never seen before footage with him preparing for his infamous jump months before it happened. The documentary touches on the emotions, physical strength training, precision weather monitoring and pure skill to achieve such a dramatic result. Lewis' pier jumping achievement created a frenzy of media reaching beyond the realms of Brighton to be a phenomenon of global explosion. It also explores why Lewis is searching for new challenges outside the competition circuit and how he uses kitesurfing and wind energy as a tool to teach others whilst increasing eco awareness. "I am stoked to be involved in a film which will really help the public understand what kitesurfing is about," Crathern said in promotional material, and spoken like a true surfer dude. Interestingly, in the film, he says this about jumping the Brighton Pier: "It made me feel alive. It made me feel like a human being." It baffles the mind as to why someone would say jumping a pier with a kitesurfing board makes you feel like a human being. Wouldn't it make you feel more like a bird? An airplane? A misguided surfer? Regardless, it's a very cool stunt, and an impressive documentary. 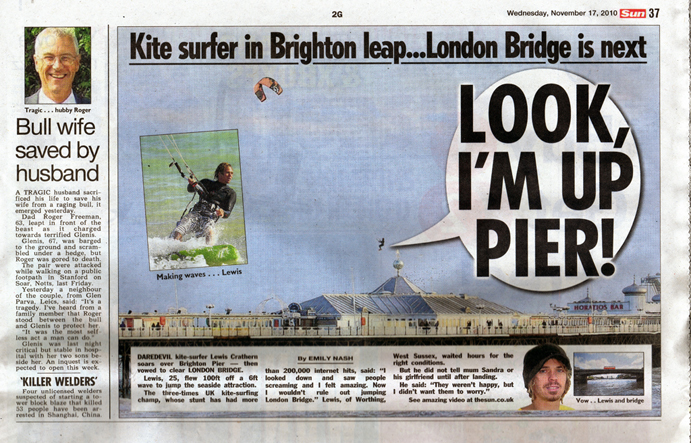 BTW: If you'd like to see the jump in 16 seconds, click "Official Kitesurfer jumps Brighton Pier! Kitesurfing champion 'Lewis Crathern.'"